Mobile apps make running your life so convenient; when you can do just any and everything from your one little phone, you can keep moving and don’t let life get in the way or slow you down. With that in mind, if you are planning to make a big move and need to schedule moving services or auto transport, there is a new app to make this process seamless for you. The A1 Auto Transport iPhone app, which is available via iTunes, provides a simple interface, into which you can enter your information and get the ball rolling on your moving or auto shipping process today. After all, if you are just planning to travel or if you are in the throes of a super move, you want to know that there are some things you can delegate to others and this is just one such area. 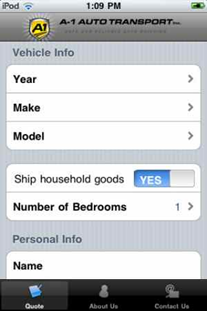 By entering some information – the make, model and year of your vehicle and whether you also need household moving services, for instance – you can then enjoy your choice of numerous quotes that come right to your phone. Peruse these various offers to find the one that not only best suits your budget, but also suits your service needs. 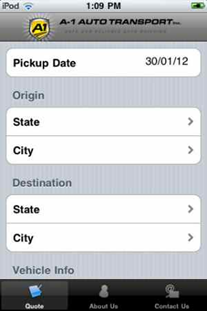 Even better is that by having this information on your phone, you can make decisions on the go. Forget about waiting until you have time to sit down at a table or computer; don’t worry about the traditional way of perusing through the phone book to find the right company with which to work. These days, moving often happens in a hurry, so you need to keep up with the pace when you are booking your services. At the same time, you need to be sure of the company you are using to ensure that what they offer is what you need. 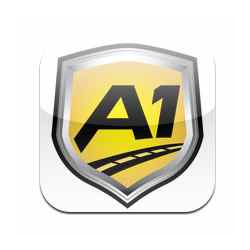 Using the A1AutoTransport.com App gives you this power, allowing to book transport quickly and efficiently with a company that boasts service you know you can trust. Keep this in mind when you are looking for an auto transport provider and don’t bother spending hours doing it the old fashioned way. This app puts speed at your fingertips, allowing you to find and book auto transport and general moving services quickly. You are then freed up to work on other aspects of your move, to ensure an overall seamless and smooth move.